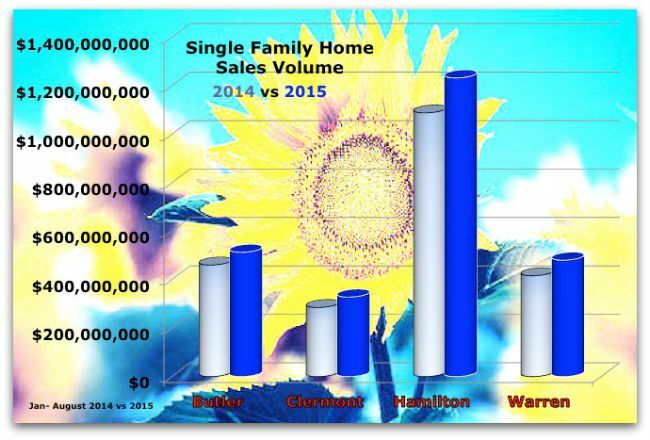 How Healthy is the Cincinnati Real Estate Market? How healthy is the Cincinnati Real Estate Market? No need for shock therapy as the month of August closes out and we head into the fall market. August 2015 was ahead of the same month in 2014 in all categories, gross dollars, number of homes sold and average sale price. Considering the lack of homes for sale- the continuing sales surge is a boost to the local economy. As the kids head back to school and the weather begins to change -the official summer market is coming to an end. During the past 3 years the average list versus average sale price for can be viewed in the chart below. As we head into 2015 the average list prices continued to rise until about June when a slight decline started. Sellers with property not yet sold need to take notes on changes in their local market. At the current pace sales and average sale prices for 2105 should exceed 2014. Everybody expects mortgage interest rates to go up – eventually so buyers and sellers still “thinking” about jumping into the real estate market need to move quickly in order to take advantage of lower rates.